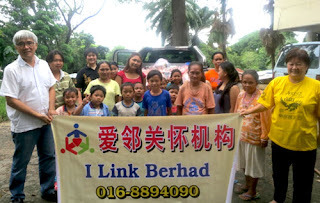 I-Link, a non-profit organization formed to help needy families, recently visited a group of natives located in Luyang, Jalan Sharif Osman to deliver some necessities such as used clothing, rice, biscuits, flour, fruits and cooking oil. The volunteers were stunned to find natives living in poverty within a mere 5 kilometer distance from the town centre. There is estimated to be over 300 natives living at this village, located not far from the Jalan Kolam Shell fuel station and connected by an old, bumpy and damaged road. Upon investigation, it was discovered that these are people belonging to the Orang Sungai and Rungus tribe. Based on their stories collected from the villagers, their fore fathers came almost 30 years ago to work in JKR as a civil servant and were allowed to build their homes in the area back then. Therefore, they were shocked to be issued with eviction notice letters recently that informed them that this land that they have called home for many years will now be taken back by the government to build the new high court. It was noted that some of these women living in the villages will even walk long distances around the Luyang area in search of recyclable items in the dump site, hoping to lighten up the burden of their husbands and bring hope to their children.